Don't miss out. It's FREE with no strings attached. This is not just another boring newsletter, ezine, etc. ( I don't like these terms anyway). …what it says it is…alerts. Brief and short notifications, delivered right to your email address to keep you posted on a regular basis, whenever something new comes up. Here's your Free Download, after you sign up. 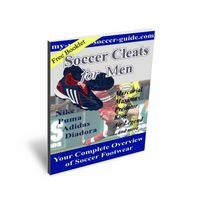 Soccer Cleats for Men - an illustrated guide of all most popular soccer cleats currently on the market. A brief description of each model includes the most important information needed while searching for the right soccer footwear. It provides an easy way to compare different models and versions within the same, as well as within different brands. You will be first to know what's new, what's hot and...what's not. retain the latest scoop in soccer equipment with reports on the current soccer gear trends and technologies and detailed reviews of the newest products, exclusively for Alerts' members. never make a doubtful and indecisive purchase with exclusive tips on what, why, where and how to buy...or not to buy. save a great deal of your time and money with instant access to a secured area including special offers and promotions, clearance sales and discounts from soccer stores around the Internet. keep up with the interesting and intriguing soccer topics from around the net. 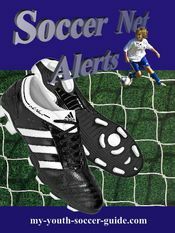 ...you'll find Soccer Net Alerts very helpful and absolutely 'must-have'.